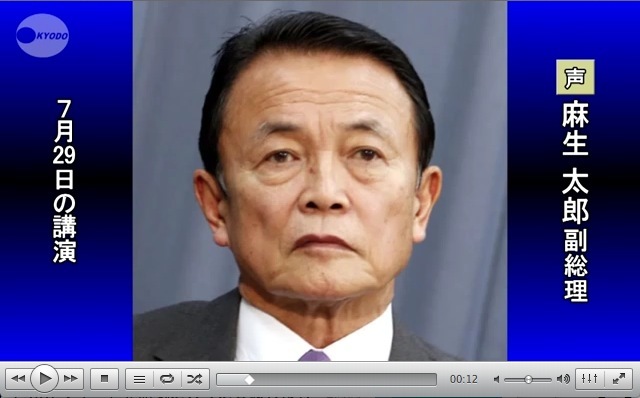 A section of raw audio recording of Japan's Deputy Prime Minister and Finance Minister TARO ASO's speech addressing the "Nazi Constitution" delivered at the JINF Regular July Monthly Session on "Revival of Japan" hosted by the Japan Institute for National Fundamentals on 29 July 2013 in Tokyo. I was taken to the Yasukuni Shrine. That was my very first visit to the Yasukuni, as far as I recall. I think I visit there at least once every year. Where did all that start from? In the old times, we all went there nice and quietly. All the Prime Ministers went, you know? So who started the uproar? The media! It's the same for the Constitution. When did the uproar start? I think. If there is an uproar, China will have to make a fuss about it. Korea will also make a fuss about it. That's why I say "Do it quietly". The Weimar Constitution was changed without even being noticed. without anybody realizing it, it was changed. Can't we learn from that tactic? You know, without causing all the uproar? Everyone said that "This is a good Constitution"
That's how the Constitution was changed with everyone accepting it. I don't mean to denounce democracy. we don't want to see this done in the midst of an uproar. This I really have to implore you. Simon Wiesenthal Center to Japanese Vice Prime Minister: Which 'Techniques' of the Nazis Can We 'Learn From'"? The Simon Wiesenthal Center urges Japanese Vice Prime Minister and Finance Minister Taro Aso to immediately clarify a statement at a lecture yesterday in Tokyo. “What ‘techniques’ from the Nazis’ governance are worth learning—how to stealthily cripple democracy?” asked Rabbi Abraham Cooper, associate dean of the Simon Wiesenthal Center, a leading Human Rights NGO, adding, “Has Vice Prime Minister Aso forgotten that Nazi Germany's ascendancy to power quickly brought the world to the abyss and engulfed humanity in the untold horrors of World War II? “The only lessons on governance that the world should draw from the Nazi Third Reich is how those in positions of power should not behave,” Rabbi Cooper concluded. For more information, please contact the Center's Public Relations Department, 310-553-9036, join the Center on Facebook, www.facebook.com/simonwiesenthalcenter, or follow @simonwiesenthal for news updates sent direct to your Twitter page or mobile device. 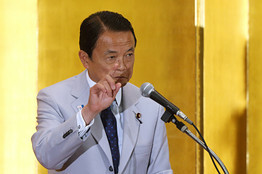 Taro Aso, Japan’s deputy prime minister and finance minister, makes a speech in Tokyo on July 25. Finance Minister Taro Aso has come under fire for comments that some listeners interpreted as suggesting Tokyo should look to Nazi Germany as a model in changing its pacifist constitution — though aides deny that intent. The reported comments from the gaffe-prone politician quickly drew criticism from a Jewish human rights group as well as from South Korea, which suffered under Japan’s past militarism. Earlier this year, Mr. Aso angered Seoul by visiting a controversial Tokyo war shrine. “Germany’s Weimar Constitution was changed before anyone noticed. It was changed before anyone was aware. Why don’t we learn from that technique,” Japanese media quoted Mr. Aso as saying. The comments were confirmed by his office. His aides said Mr. Aso was in his local district on the southern island of Kyushu on Wednesday and couldn’t be reached for comment. 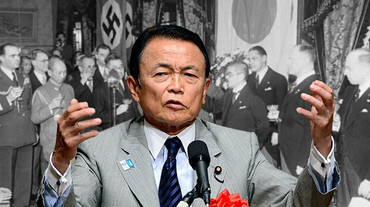 But they said his remarks were taken out of context, and Mr. Aso didn’t say anything to praise Nazi Germany. Rather, he was trying to convey how discussions over constitutional revision should be conducted in a calm environment. A report by Kyodo news agency also quoted Mr. Aso as saying how the Weimar constitution was the most “progressive” in Europe at the time, but that the Nazis emerged under it. “Even under a good constitution, things like that happen,” he was quoted as saying. 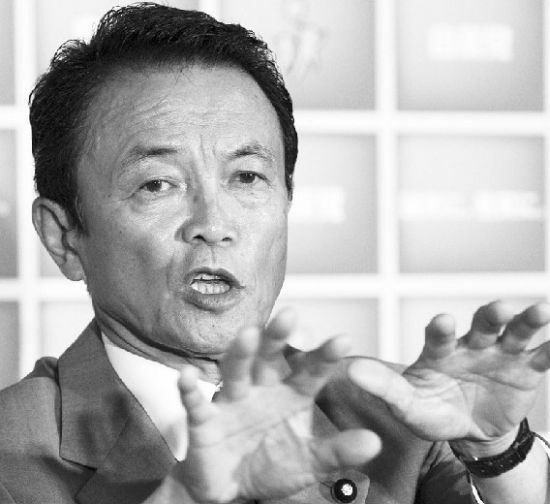 Whatever Mr. Aso’s intended meaning, the extended quotes in the Japanese media suggest that, as is sometimes the case, his comments were a bit rambling, and the point was articulated in an ambiguous manner that could leave members of the same audience reaching different conclusions — or at least scratching their heads. Mr. Aso was speaking at an event organized by the Japan Institute for National Fundamentals, a conservative think tank that has called for revising the constitution. The group has also stirred controversy by denying widespread claims Japan’s military was involved in forcibly recruiting women to work in battlefield brothels during the war. Mr. Aso’s reported comments immediately drew criticism from South Korea, whose relationship with Japan has been strained by disputes over Japan’s wartime actions and territorial disagreements, and which views warily Japanese Prime Minister Shinzo Abe’s drive to revise the postwar pacifist constitution. “It is also clear how such remarks are seen by the peoples of neighboring countries invaded by imperial Japan in the past. I believe that the Japanese political leaders should be careful with their words and behavior,” Mr. Cho said, according to an official ministry transcript. The Los Angeles-based Jewish human rights organization, the Simon Wiesenthal Center, also released a statement Tuesday urging Mr. Aso to clarify his remarks. “What ‘techniques’ from Nazis’ governance are worth learning–how to stealthily cripple democracy?” the statement quoted rabbi Abraham Cooper, associate dean of the SWC, as saying. 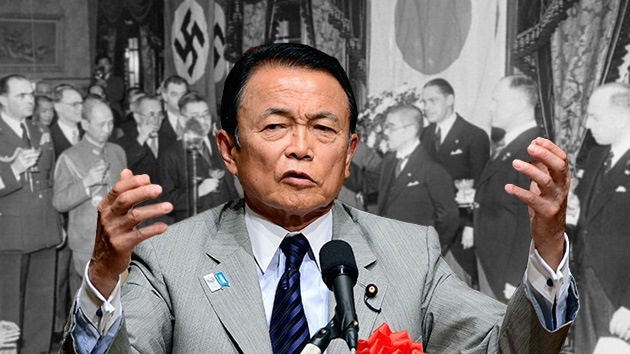 “Has Vice Prime Minister Aso forgotten that Nazi Germany’s ascendancy to power quickly brought (the) world to the abyss and engulfed humanity in the untold horrors of World War II? The only lessons on governance… from the Nazi Third Reich are how those (in) positions of power should not behave,” Rabbi Cooper concluded. Japan’s top government spokesman declined to comment, saying the issue was up to Mr. Aso. “I believe this is something that Minister Aso should respond to,” Chief Cabinet Secretary Yoshihide Suga told a news conference. During his 2008-2009 premiership, he said doctors were “lacking in social common sense,” and that stock market players were “not trusted.” He once publicly uttered a sigh of relief that it was a “good thing” that a 2008 rain storm “took place in Okazaki,” where two people died in the storm, and not in more populous Nagoya. 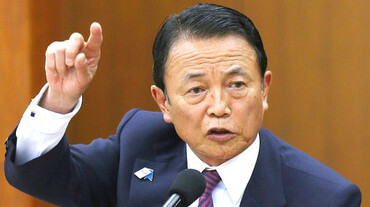 After becoming finance minister last December, Mr. Aso found himself in the hot seat after local media reported he said the country’s elderly should die without using expensive life-sustaining treatment funded by taxpayers. He denied the reports, saying he was misinterpreted. He also drew attention in June for suggesting the main reason Japan’s banks avoided the subprime crisis was that their poor command of English stopped them from making the complicated investments. 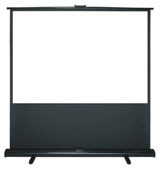 –Toko Sekiguchi contributed to this item. 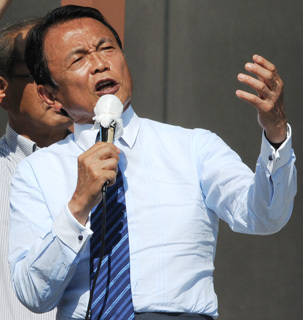 Outspoken Finance Minister Taro Aso has caused another international stir by urging Japanese politicians bent on revising the Constitution to learn from the way Germany under the Nazis amended the Weimar charter. 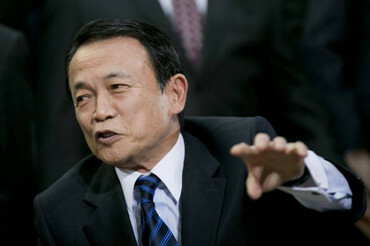 Aso’s remark drew criticism from South Korea. But Aso’s remark, reportedly made Monday in a speech in Tokyo, sounded ambiguous and may simply have been just more sarcasm over Japanese rushing to amend the Constitution. The Liberal Democratic Party, to which Aso belongs, is seeking to revise the Constitution, including war-renouncing Article 9, so Japan can use the right of collective self-defense as stipulated by the U.N. Charter. This would expand the scope of military cooperation with the U.S. 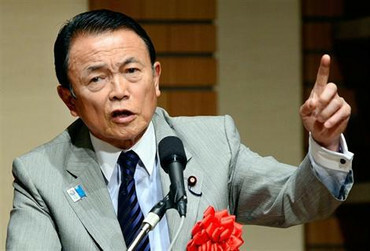 The LDP also wants the Self-Defense Forces to be renamed the National Defense Forces and so noted in the Constitution. “The purpose of constitutional revision should be the stabilization and peace of the state. 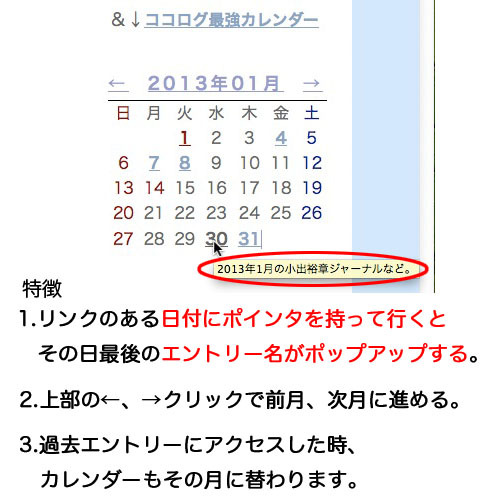 Constitutional revision is a just means” for that goal, Aso said, according to Kyodo News and other media reports. Then Aso mentioned how the Nazis effectively abolished the 1919 German Constitution. “(The Nazis) did it in a ‘let’s-keep-it-quiet’ manner, and the Weimar Constitution was changed almost before people realized it. Why don’t we learn from that method?” Aso said. His remarks are contradictory because while on the one hand he urged people to make a level-headed decision, he also recommended the revisionists learn from the Nazis’ way of changing the German charter on the sly. The latter may have been a sarcastic comment against politicians bent on revision, since Aso often uses sarcastic, intricate rhetoric when he criticizes somebody. But South Korean Foreign Ministry spokesman Cho Tai-young blasted Aso on Tuesday. Politiker Taro Aso: "Warum lernen wir nicht von ihrer Taktik?" Japan erwägt eine Änderung seiner Verfassung, will endlich reguläre Streitkräfte. Vizepremier Taro Aso hat auch gleich ein Beispiel parat, wie so etwas ohne großes Aufsehen ablaufen könnte: die Machtübernahme der Nazis. Das Simon-Wiesenthal-Zentrum forderte eine Erklärung. Tokio - Mit einem Lob der politischen Taktik der Nationalsozialisten hat Japans Vize-Regierungschef Taro Aso für Kritik gesorgt. Dieser hatte erklärt, Japan könne von den Nazis bei der Umsetzung von Verfassungsreformen lernen. "Die deutsche Weimarer Verfassung wurde, ohne dass dies auffiel, durch die Verfassung Nazi-Deutschlands ersetzt. Warum lernen wir nicht von ihrer Taktik? ", sagte Aso laut Medienangaben bei einer Rede am Montag. Er bezog sich damit auf die geplante Änderung der japanischen Verfassung, die derzeit in den Medien sowie bei den Nachbarn China und Südkorea für Aufregung sorgt. Die regierende Liberaldemokratische Partei von Ministerpräsident Shinzo Abe erwägt eine Änderung der Verfassung, die Japan auf Druck der USA seit dem Zweiten Weltkrieg auf eine pazifistische Außenpolitik festlegt. Angesichts aktueller Gebietsstreitigkeiten mit China und Südkorea sollen die japanischen Verteidigungskräfte nach dem Willen der Regierungspartei nun aber zu regulären Streitkräften aufgewertet werden. Japans Regierungssprecher wollte sich am Mittwoch auf Nachfrage nicht zu Asos Rede äußern. Der stellvertretende Ministerpräsident sollte Fragen selber beantworten. Das Simon-Wiesenthal-Zentrum forderte Aso dagegen auf, seine Äußerung zu erklären. "Die einzige Lehre zur Regierungsführung, welche die Welt aus dem Dritten Reich ziehen sollte, ist, wie die Machthabenden nicht handeln sollten", hieß es in einer Stellungnahme des Zentrums. Taro Aso hat die heimliche Aushebelung der Weimarer Verfassung durch Nazi-Deutschland als mögliches Modell für Japan bezeichnet. Das Ausland reagiert empört. Der japanische Finanzminister Taro Aso hat mit einer positiven Äußerung zur Zeit der Nationalsozialisten international für Empörung gesorgt. Japan könne von Nazi-Deutschland lernen, wie eine Verfassung ohne großes Aufsehen geändert werden könne. Aso, der zugleich stellvertretender Regierungschef ist, soll damit die pazifistisch geprägte Verfassung seines Landes gemeint haben. "Die Weimarer Verfassung wurde, ohne dass es bemerkt wurde, hin zur Nazi-Verfassung Deutschlands verändert. Warum lernen wir nicht von ihrer Taktik? 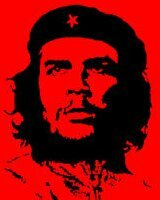 ", soll Aso Medien zufolge bei einem Vortrag Anfang der Woche vor einem konservativen Think Tank gesagt haben. Zudem bezeichnete er sie als eine der "fortschrittlichsten Verfassungen" damals. Sein Büro soll laut dem Wall Street Journal die Aussagen bestätigt haben. Allerdings wurde dementiert, dass Aso den Umgang der Nazis damit auf Japan anwenden wolle. Zudem seien die Aussagen aus dem Zusammenhang gerissen, der Finanzminister habe die Nazis nicht loben wollen. Asos Aussagen wurden umgehend kritisiert. Ein Sprecher des südkoreanischen Außenministeriums sagte, dass die Aussagen "viele Menschen verletzen" würden. Sein Land habe unter dem militärischen Imperialismus Japans in der Vergangenheit besonders gelitten. Japans Politiker sollten vorsichtig sein mit ihren Worten und ihrem Verhalten. Das Simon Wiesenthal Center in Los Angeles forderte eine sofortige Klarstellung Asos. "Welche Techniken sollten wir von den Nazis lernen? Wie eine Demokratie heimlich verkrüppelt wird? ", hieß es in einer Stellungnahme der jüdischen Menschenrechtsorganisation. Die regierende Liberaldemokratische Partei von Ministerpräsident Shinzo Abe erwägt derzeit eine Änderung der Verfassung, die Japan auf Druck der USA seit dem Zweiten Weltkrieg auf eine pazifistische Außenpolitik festlegt. Angesichts aktueller Gebietsstreitigkeiten mit China und Südkorea sollen die japanischen Verteidigungskräfte nach dem Willen der Regierungspartei nun aber zu regulären Streitkräften aufgewertet werden. Tokio (RPO). Mit einem Lob der politischen Taktik der Nationalsozialisten hat Japans Vize-Regierungschef Taro Aso für Kritik gesorgt. Das Simon-Wiesenthal-Zentrum forderte Aso am Dienstagabend auf, seine Äußerung zu erklären, wonach Japan von den Nazis bei der Umsetzung von Verfassungsreformen lernen könnte. "Die einzige Lehre zur Regierungsführung, welche die Welt aus dem Dritten Reich ziehen sollte, ist, wie die Machthabenden nicht handeln sollten", erklärte das Zentrum. INTERNATIONAL - Le Japon, à l'heure de réformer sa constitution, pourrait "s'inspirer" de l'Allemagne nazie, a déclaré lundi 29 juillet le vice-Premier ministre japonais Taro Aso, s'attirant une vive réaction du Centre Simon Wiesenthal. "La constitution de l'Allemagne de Weimar a été discrètement remplacée par la constitution de l'Allemagne nazie: pourquoi ne pas s'inspirer de leur tactique? ", a dit Taro Aso lors d'un débat organisé par un centre de recherches conservateur. Le Centre Simon Wiesenthal a immédiatement affirmé que "les seules leçons en matière de gouvernement que des responsables puissent tirer du Troisième Reich nazi portent sur les choses à ne pas faire". Mercredi, le porte-parole du gouvernement, Yoshihide Suga, s'est refusé à tout commentaire, en soulignant que "c'est au vice-Premier ministre Aso de répondre". Auréolé d'une nouvelle victoire électorale, le Parti Libéral-Démocrate (PLD, droite) du Premier ministre Shinzo Abe a fait savoir qu'il souhaitait réformer la constitution pacifiste imposée au Japon par les Etats-Unis au lendemain de la Seconde Guerre Mondiale. Cette annonce est intervenue alors que des nouvelles tensions se faisaient jour avec la Chine et la Corée du Sud. Ces deux voisins, pour qui le Japon n'a jamais vraiment tourné la page de son passé militariste, s'en sont inquiétés. Taro Aso, qui est également ministre des Finances, est connu pour ses gaffes. En début d'année, il avait dû présenter ses excuses après avoir appelé les personnes en fin de vie à mourir "rapidement" pour réduire les dépenses de santé. Au moment de réformer la constitution du Japon, le vice-Premier ministre a déclaré vouloir « s’inspirer » de l’Allemagne nazie. La polémique enfle. Le Japon, à l’heure de réformer sa constitution, pourrait « s’inspirer » de l’Allemagne nazie, a déclaré le vice-Premier ministre japonais Taro Aso, s’attirant une vive réaction du Centre Simon Wiesenthal. « La constitution de l’Allemagne de Weimar a été discrètement remplacée par la constitution de l’Allemagne nazie : pourquoi ne pas s’inspirer de leur tactique ? », a dit Taro Aso lors d’un débat organisé lundi par un centre de recherches conservateur. Le Centre Simon Wiesenthal a immédiatement affirmé que « les seules leçons en matière de gouvernement que des responsables puissent tirer du Troisième Reich nazi portent sur les choses à ne pas faire ». Mercredi, le porte-parole du gouvernement, Yoshihide Suga, s’est refusé à tout à commentaire, en soulignant que « c’est au vice-Premier ministre Aso de répondre ». Auréolé d’une nouvelle victoire électorale, le Parti Libéral-Démocrate (PLD, droite) du Premier ministre Shinzo Abe a fait savoir qu’il souhaitait réformer la constitution pacifiste imposée au Japon par les Etats-Unis au lendemain de la Seconde Guerre Mondiale. Cette annonce est intervenue alors que des nouvelles tensions se faisaient jour avec la Chine et la Corée du Sud. Ces deux voisins, pour qui le Japon n’a jamais vraiment tourné la page de son passé militariste, s’en sont inquiétés. Taro Aso, qui est également ministre des Finances, est connu pour ses gaffes. En début d’année, il avait dû présenter ses excuses après avoir appelé les personnes en fin de vie à mourir « rapidement » pour réduire les dépenses de santé.